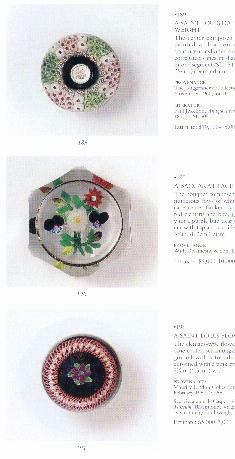 (New York, September 24, 1997)"
Fabulous catalog from Christie's sale of the Henry Stern Collection. This is an important sale of an unusually rich collection. New Orleans antique dealer Henry Stern amassed this outstanding collection between 1950 and 1993. There are 194 lots in this auction. Every lot is shown in color. 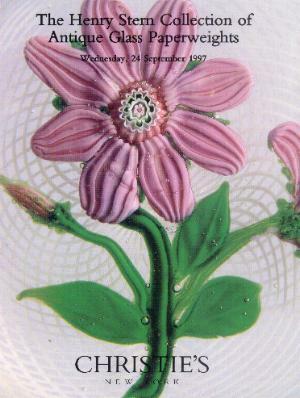 The collection included a wide variety of antique paperweights. Most were French, but a few American antique weights were included. Several 20th century weights were also included. was $26,450 for an unusual St. Louis carpet ground weight, but it is also surprising how many lots sold for under $1,000. Click on the picture to see an example of one of the inside pages.